This is an aerial photo of Banner Avenue just two lots over from the EAS Banner facility. 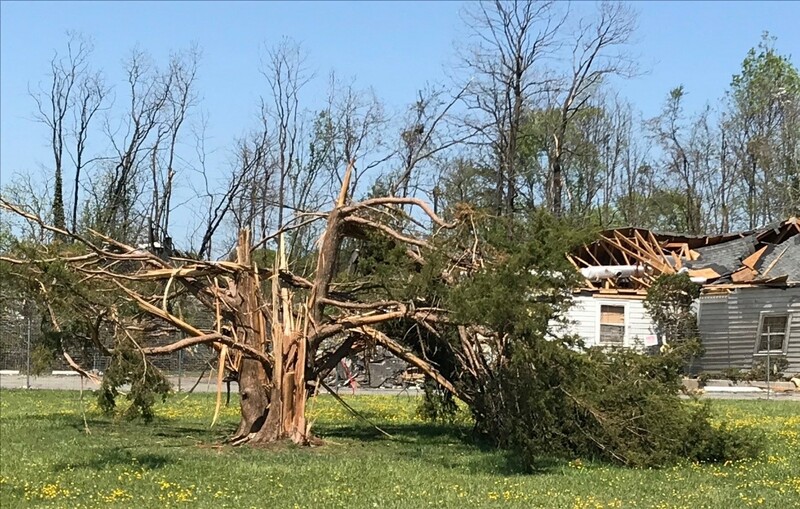 A tornado that cut a path of destruction and destroyed homes in Greensboro on Sunday had wind speeds of 135 mph, making it an EF-2 twister. 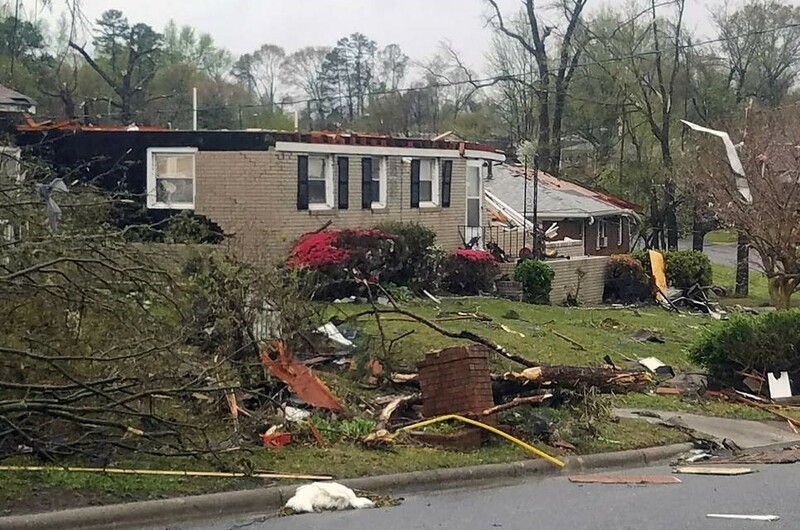 A line of severe weather spread across North Carolina, bringing heavy rainstorms and two reported tornadoes that toppled trees and ripped apart homes in Greensboro and Reidsville. At least one person was found dead, according to news outlets in the Piedmont. About 75,000 homes and businesses were without power late Sunday afternoon in the Carolinas. Duke Energy said about 43,000 customers lacked power in North Carolina, and another 9,000 in South Carolina. 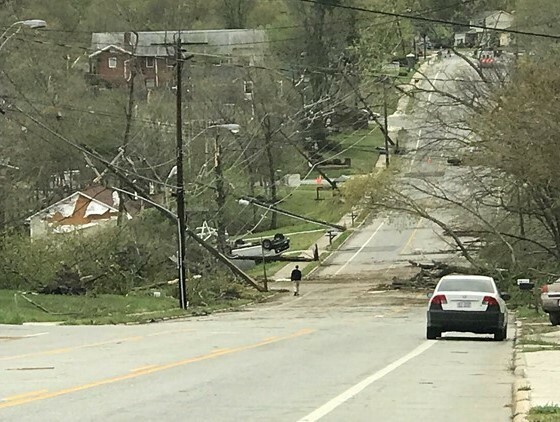 South Carolina Electric and Gas Company reported 23,000 customers without power in South Carolina. The city of Greensboro and Guilford County both declared states of emergency. 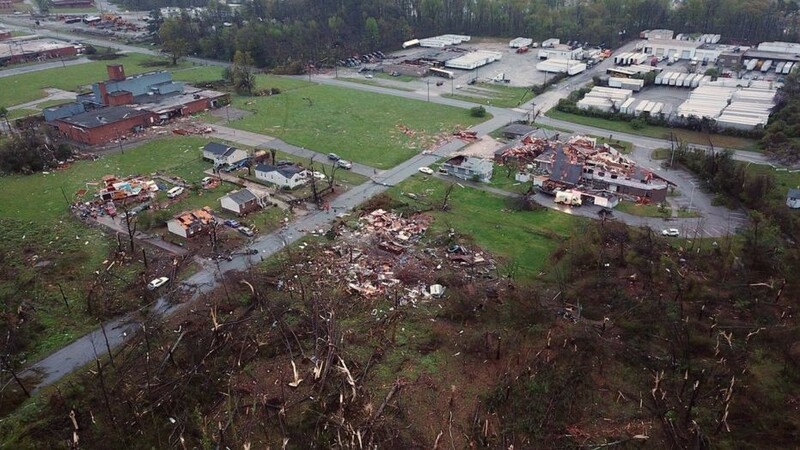 Search and rescue teams went house-to-house in the affected areas, and the Civil Air Patrol conducted an aerial assessment of Guilford and Rockingham counties. The front yard of the EAS Banner facility. 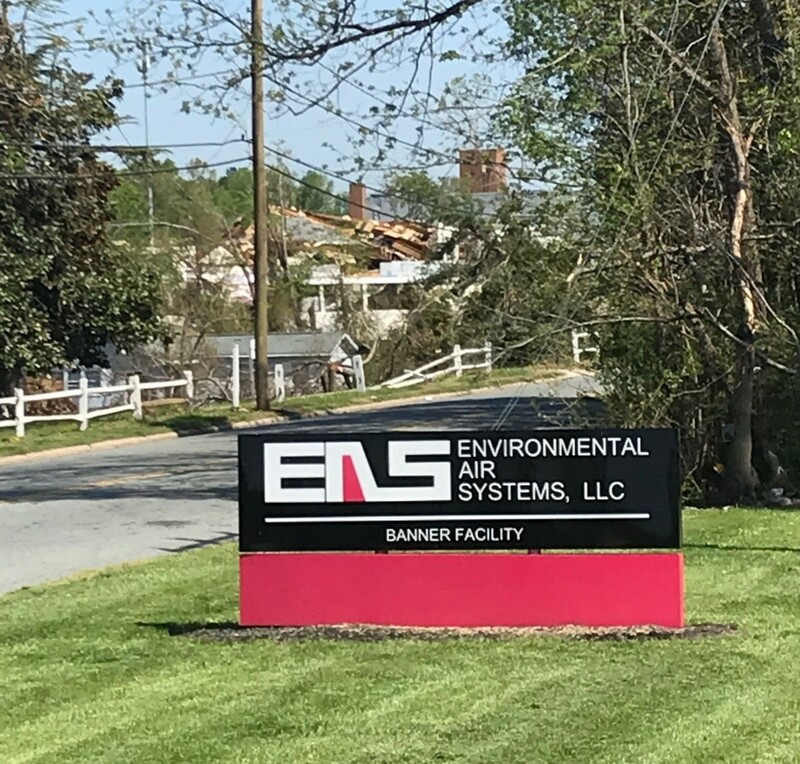 The Environmental Air Systems Banner facility located in east Greensboro while surrounded by severe tornado damage was largely spared receiving a power outage and only minor damage. Fortunately, the tornado ripped through the area during a time when workers were not present. 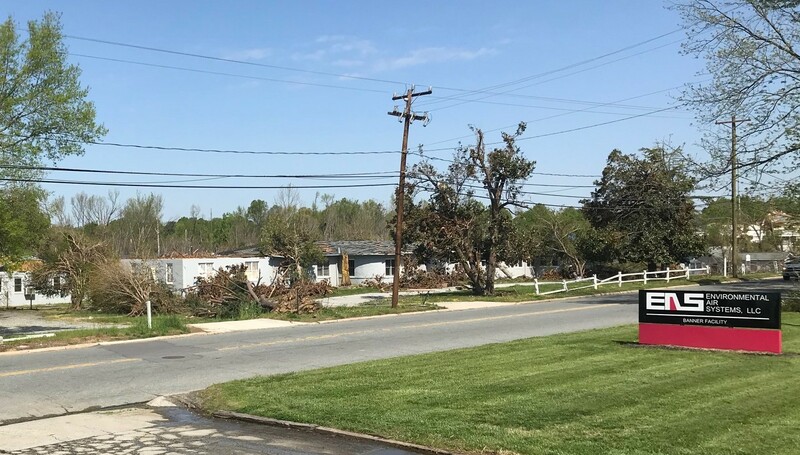 An assessment was made by Allen Absher, VP & GM Manufacturing and Robert Alexander, Plant Manager at the site Sunday afternoon shortly after the tornado swept through the area. Nearby homes and businesses all around the EAS Banner facility received significant damage.On Monday and throughout the week EAS workers pulled together and immediately began moving computers and offices into their new Headquarters facility, two weeks prior to its scheduled move. A number of people worked many extra hours and helped to get offices relocated and up and running with minimal delay. Payroll had to be run, design had to maintain project schedules and accounting had to remain functioning. Generators were brought in to get the Banner sheet metal factory back on line to keep up with our backlog and customer needs as hundreds of field workers were counting on their shipments. IT, with the support of others worked nearly around the clock to provide the needed computing power, phones and necessary facility access and fire and life safety systems at the relocated facility. Downed power lines and trees. It was truly a heroic effort by many EAS team members to quickly assess the situation, make decisions, bypass downed trees and power lines to move the necessary equipment, get things up and running and establish order in another location all in a matter of just a few days. A number of EAS employees also walked around the nearby Banner neighborhood handing out food and water to the many neighbors in need. Without such dedication, this never would have happened as seamlessly as it did. Thank You and a tremendous level of gratitude to everyone at EAS that contributed to this heroic effort. The pride and commitment shown by many is now part of the EAS legacy. Banner Avenue just down from the Banner facility. The neighborhood near the EAS facility.